Having visited my friends place and seen the latest interiors in the recent times, I wish my room would get a makeover to keep my valuable stuff organised and easily accessible, without having to search. The paint color on the wall, the curtains and the tiles on the floor should be matching and provide a soothing and a calming effect. Godrej Interio offers interior designing with their professional designers who realize your needs and come up with best solution for your home. They would understand my need of maintaining the things organized, such as a separate space to keep my music instruments like Veena and Keyboard, shelf to hold all my books - both read and unread, my small photo studio which houses the photography gears, camera body and the special lights, a table which is well lit for study and I could stuff all my souvenirs which I collected during my travel, a wardrobe to arrange the clothes, jackets and shoes for all seasons and occasions. A space for my clothes stand and iron stand where I dry and press all my clothes...and a nice dressing table where I can place the makeup Kit, hair dryer and other stuff. It is space saving and nice to have foldable chair when my friends visit me. Apart from this I need space to hang my huge 32 inches TV on the wall such that I can watch my favorite movies lying down on the cot. An adjustable light to read books while going to sleep is a must to have. Apart from these I would like to hang my Cuckoo Clock which I bought as memorabilia without nailing the wall. I would also like to have my travel postcards on the wall without having to glue them. 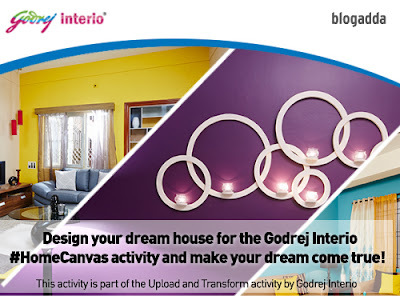 I know its not a tiny wish but its NOT an impossible task when you have professional designers for Godrej Interio who can solve any thing harder than a puzzle.